Although Eastern Europe has been part of the Christian world for more than a thousand years, its spiritual identity remains a mystery. This mystery, says Sergei Prokofieff, can only fully be solved by looking behind external events and seeking spiritual – meta-historical – dimensions of reality. In illuminating the maya of outer history, Prokofieff reveals the forces that have been at work to hinder the progress of mankind: the materialistic Brotherhoods of the West and the occult aspects of both Jesuitism and Bolshevism. These adversary groups have created a ‘karma of materialism’, that the eastern Slavic peoples have taken upon themselves out of their ‘exalted willingness for sacrifice’. Prokofieff shows how, from the earliest times, the future ‘conscience of humanity’ flowed from hidden mystery centres in Hibernia, to the eastern Slavic peoples. As a result, qualities of ‘compassion, patience and willingness for sacrifice’ developed in their souls, creating a truly Christian ‘Grail mood’. Despite incalculable suffering – from the persecutions of the Mongol hordes to the Bolshevik experiment of the last century – this quality has become an unconquerable force. Will humanity be able to use the present opportunity granted by this sacrifice to fulfil the primary purposes of the present cultural epoch? Can the future mysteries of the Holy Grail be fulfilled? 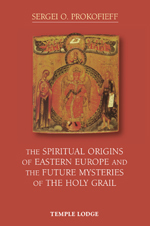 In this momentous work, breathtaking in its scope and detail, the author attempts a truly esoteric approach, penetrating to the spiritual wellsprings of Eastern Europe in the light of Rudolf Steiner’s research. SERGEI O. PROKOFIEFF (1954-2014) studied Fine Arts and Painting at the Moscow School of Art. He encountered the work of Rudolf Steiner in his youth, and soon decided to devote his life to it. He became active as an author and lecturer in 1982, and helped found the Anthroposophical Society in his native Russia in 1991. In Easter 2001, he was appointed as a member of the Executive Council of the General Anthroposophical Society in Dornach, Switzerland, on which he served until his death. A popular speaker, he authored numerous books and articles that are published in many languages.